I nearly missed this! I was reminded of it by the WCU website, and when I looked at the entry - 18 GMs, 10 IMs, 6 FMs, as well as two WIMs and a WF, AND John Trevelyan, AND Jonathan Blackburn - I just had to have a go. After all, this was the strongest tournament on the British mainland since the 80s! The event was held at the Liverpool World Museum under excellent playing conditions. In the first round, I was rather disappointed to have drawn a young lad, Martin Brown, rated at 107 ECF. Jonathan told me that he had been helping him develop his chess, and that he was actually about 130. Whatever his grade, he made his way successfully through the complications I threw at him, and I had to agree a draw. My sore feelings were assuaged somewhat in Round 2, when young Martin also extracted a draw from David Eggleston (Fide grade 2232). A name to look out for in the future! Jonathan had a tough tournament which will have been good experience for him. 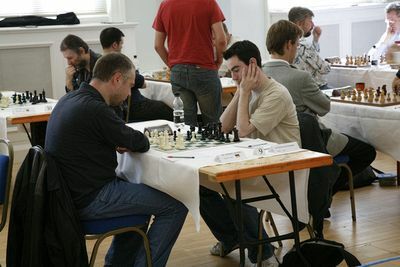 His opponents included two GMs (Germany's Thomas Luther and John Shaw from Scotland), and two IMs (Mika Karttunen of Finland and Gawain Jones who came equal 2nd). His final score was a creditable 5/10, including a victory over veteran John Littlewood. 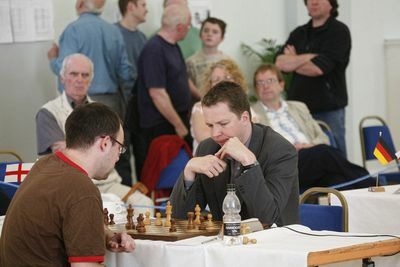 John Trevelyan also finished on 5/10, which included encounters against GMs Viesturs Meijers of Latvia and the unpronounceable GM Alexandre Dgebuadze of Belgium. Before his game against the comely WFM Alexandra Wilson of Switzerland (photo above), I remarked to him that I had to make sure that I got a photo of "Beauty v The Beast". John said "Pat, you shouldn't call a nice young lady like that The Beast!" 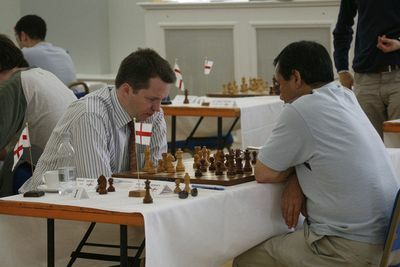 Nigel Short seemed to be running away with the tournament at the half-way stage with 4.5/5, but a series of draws enabled a pack of players to join him on 6.5 at the end of Round 9. 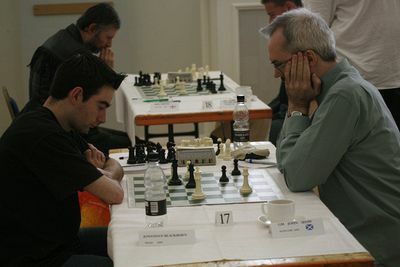 However, he pulled out the stops to defeat GM Mark Hebden in the last round, finishing the only player on 7.5 points. In Round 9, I defeated Alexandra Wilson, putting me on 50%, giving me a chance of achieving my target of 5/10. However, I had mixed feelings on finding that my last round opponent was to be GM Viesturs Meijers - disappointment that I was unlikely to make my target, but delight that I had the chance of playing a GM. No mixed feelings about the result, though - my opponent was obviously suffering from Last Round Blues, and I achieved a life time's ambition - victory over a GM!